make them fly far away and look very beautiful with lights in the sky or at the night, which promotes the children's exercise. Step 1: Put the disc on the bottom of the twisty pull tube. Step 2: Push the disc up forward and at the same. Step 3:You can adjust and control the power. immediately and we will deal with any tough situation for you. 【Safe Material】 Made of light weight plastic, namely environmental protective materials in non-toxic and tasteless condition. Easy to carry. Battery included. 【Portable, easy and safe to play】 Plastic flying disc toys, come with a shooter, twist it by your hand, and disc fly away. Via playing this toy, enable to train the children's control ability and can improve children's hand-eye coordination. 【Target users】 A funny and great toy gift for children aged more than 4years old girls and boys to play with friends and parents in the outdoor activities. 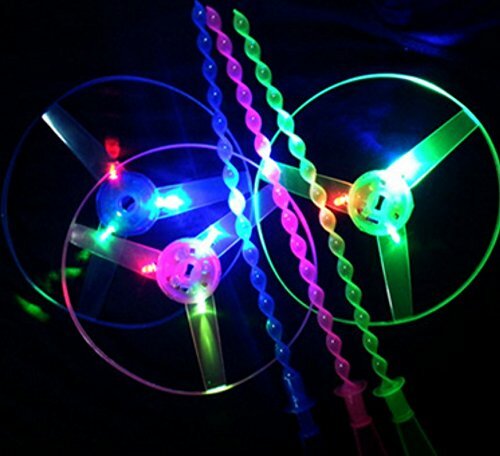 【Package Included】 4 x pull string flying discs; Length: Approx 31.5cm/12.40inch; Diameter: 17.5cm/6.88inch; Color :green,yellow,blue and pink. 【Quality Guarantee】 In the store, you can enjoy the free return policy. If you have any questions, please feel free to contact us, and we will do our best to help you. If you have any questions about this product by DISC, contact us by completing and submitting the form below. If you are looking for a specif part number, please include it with your message.